This report depicts the obstacles and repression against civil society in the region and showcases first-hand accounts from Turkey, Egypt, Algeria, Syria, Israel and the Occupied Palestinian Territories among others. The report also features recommendations by CSOs for joint action and seeks to influence EU policies to that effect. The report also focuses on the impact of security and anti-terrorist policies and lists the growing arsenal of repressive measures – both in law and practice – that CSOs face on a daily basis: judicial harassment, surveillance, arbitrary arrests, torture and assassination. 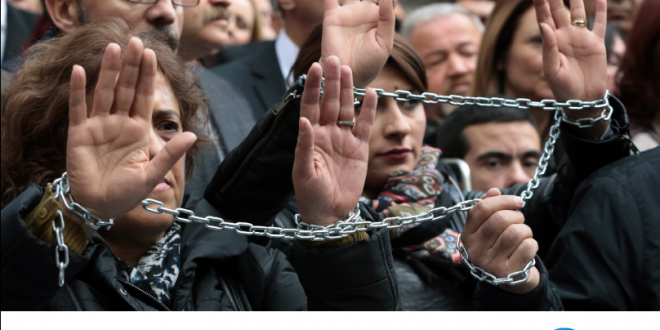 Despite legal safeguards and the human rights “shared values” rhetoric in the EU, EuroMed Rights argues that European civil society is under increasing pressure. Austerity measures and anti-terrorism laws are increasingly used to legitimise practices that go against individual freedoms and rights of assembly, association and expression, such as in France, Spain or the UK, for instance. The report is the result of a seminar organised in April 2016 as an open dialogue between EU representatives, South Mediterranean activists and Brussels-based CSOs.